Welcome to Forestgate Millwork Stairs Page. Please read below to find out about all of our services including Railings, Tread Covers and Newel Posts. 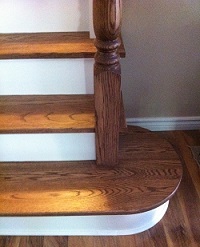 Forestgate Millwork offers expert level Stairs, Railings, Tread Covers and Newel Posts. The Stair and Railing process begins with a concept, and each project is unique unto itself. The stair may not only have to fit properly, and meet municipal building codes, it also has to ensure a proper balance between space, material, and comfort. With ease, Forestgate is able to take existing structure and replace stair and rail and/or build from new, working from architectural plans. Stair and rail is often a feature design element in all homes, and is responsible for immediate impressions, whether painted or stained. Mood and style are supported in features such as newel posts and balusters, ornate, simple, classic, or modern. Through working with quality materials and a timeless tradition of Stair-building Techniques, Forestgate Millwork will ensure a lasting product for years to come. This demand for commitment to quality and integrity starts at the top and continues down to highly skilled craftsmen in the field during the Stair/Railing Installation. Stair Renovation offers a unique solution to tired and worn stair and rail from previous decades. Homeowners can update existing treads with a new hardwood tread that could be Oak, Maple, Walnut, or Cherry; the possibilities are simply up to you. During this process, the railing needs to be removed, (this is a good time to update!) choose from French Provincial turned newel posts and balusters to Victorian Era Posts with a square baluster and a chunky railing. Century homes represent some of the utmost in stair and railing design, where functionality meets imagination and creativity. Wood is a versatile product, stunning in its own right; its attributes lend itself naturally to fulfill purpose in our everyday lives. With Century homes as our muse, it is definitely the level of craftsmanship you should demand and Forestgate will aspire to and achieve. Balusters and their complementary railing is typically an area of your home that can have one of the greatest impacts in establishing your home’s overall style. Forestgate Millwork can offer its clients expertise in choosing balusters and rail that complement one another in style, whether classic or modern. Railings come in a range of profiles, thicknesses, and design. Forestgate can introduce you to the styles appropriate for your project and existing, or developing style, whether it be a simple profile and dimension on upward to an ornate design typical of a century home. Classic designs range from finishes in stained oak in medium to ebony or a painted maple that has a more modern theme. When choosing a railing it has to be aesthetically pleasing, but it also has to be functional and comfortable. Tread covers are a modern solution to a common problem customers encounter in a resale situation or renovation project. Tread covers allow a previously carpeted or painted staircase the opportunity to be easily redesigned without the hassle of a major construction project. Typically when removing an existing staircase, demolition is followed by framing, drywall, trimwork and painting. Let Forestgate Millwork treat your existing stair to a fabulous makeover with premium tread covers and seamless installation. The tread covers will always be a ¾” hardwood of any variety of species with a 1” or greater front nosing profile, only the best quality for Forestgate clientele. The newel post is the structure of the balustrade system anchoring the handrail at the top and bottom of the staircase. These can come in a range of styles suiting your design style and can complement your homes architectural theme. Styles range from boxed newel with recessed panel, fluted design, raised panel , Victorian, or craftsmen. A turned or round profile is also available which can add an elegant feel combined with a taper top baluster. Our trademark style is evident with our sophisticated use of high-end finishes combined with our unique designs, creating environments that enrich the lives of our clients. Cresmark is a Kitchen Renovation Company in Oakville. Our consumer satisfaction rate, extended warranties, along with a long list of enthused clients are all a testament to our unwavering commitment to our clients’ best interests and to our consistent ability to deliver projects – on time and on budget... Providing our clients with Peace of Mind that their investment and home will be well taken care of. Every decade brings new standards, expectations of comfort, of heating and of maintenance. As well as a new set of needs and desires regarding living space and how it is used. Yet many houses that need to be updated have an underlying charm, beauty, and grace that are far too lovely to tamper with. We specialize in renovating the interior and exterior of homes in the Greater Toronto Area while keeping faith with the neighbourhood and respecting the character and integrity of the original structure. We are proud of our reputation as being among the most talented, honest contractors in Oakville. Our goal is to ensure the complete satisfaction of every client. From a small project to a major remodel, 360 Custom Contracting Inc. will exceed all of your expectations. Passion for helping others and a true love for Oakville and Burlington Real Estate Agents are two of the driving forces behind Quinn Podaima. Quinn’s vast experience in real estate, combined with her deep knowledge of Oakville and Burlington neighborhoods, make her an invaluable partner in buying or selling a home in the Area; Oakville Real Estate Agent and that is just how Quinn views her relationships with her clients… as true partnerships. Real estate is a relationship-based business and Quinn values this aspect most in her practice. Genesee Martin is Family Lawyer in Oakville law firm with 70 years of combined experience, Genesee Martin has provided effective legal services to individuals requiring assistance in a broad range of fields. Our lawyers are experienced in the areas of family law, criminal law, personal injury law, employment/labour law, and wills and estates. We work directly with you, our valued customer, to ensure that you are confident and comfortable with your design and renovation choices. We work diligently and efficiently so that you and your loved ones can enjoy the luxuries of your new kitchen and bathroom as quickly as possible. Satisfied Home owners in Oakville have been calling 360 Custom Contracting in Oakville for over 15 years for their remodelling design projects. Our custom closets are fully adjustable. You can move shelves up or down, add hanging sections or shoe racks, all depending on your current storage needs. There are handy accessories like tie racks, belt racks, jewelry trays, valet rods and hampers. Placed where you need them - where they are useful. We can even add built-in mirrors and ironing boards – great for small spaces. Uber Custom Closet Storage Mississauga Uber Custom Storage offers a 100% satisfaction guarantee on all services we provide, if a product we install fails during normal use we will replace it free of charge. Burlington roofing specialists is a full service roofing company specializing in sloped roofing. We provide all your roofing needs in the GTA. At Burlington Roofing we dedicate ourselves to quality installs at competitive pricing. We pride ourselves in the service we provide and the expertise of our installers. We strive to surpass the minimum code requirements of local building codes and closely follow recommended manufacturers installation practices. Our selection of quality manufacturers and installation procedures gives you the confidence of a 10yr total system warranty. If your home or place of business doesn't have natural gas lines installed, you've come to the right place. We have a team of gas line installers in Milton standing by to run your natural gas lines today. Installing natural gas lines in Milton can bring a new level of pleasure to your home or place of business, but it is a projecty that must be done with great care. Web Response is a digital design and internet marketing company that prides itself on real results within the city of Hamilton. Our key focus is on Website Design and Development, Search Engine Optimization, Social Media Management and Internet Marketing. We design websites that help convert visitors into clients! We want to make the Internet an accessible and successful addition to any business. We are leading Hamilton Internet Marketing and Search Engine Optimization Specialists. We can help drive more unique visitors to your website. The kitchen plays an important role in your home and in your family life so it should be everything you want it to be. At Burloak Contracting, we understand that your kitchen is the heart of your home in Burlington. We know that while you want the kitchen of your dreams, you may be hesitant to do anything about it. We can put your worries to rest when it comes to Kitchen Design and Basement Renovation in Burlington. With as much or as little help from us in the designing phase, we can create plans to create the kitchen of your dreams. The key to our success is our attention to the smallest detail no matter what the job might be. View our portfolio and see the commitment Forestgate Millwork will have for your project.